Saddle on up on Canyon Lake property and take to the trails. Exploring the Texas landscape on horseback is the best way to do it. At Sunnye’s Stables the mounts are gentle yet spirited, and they know the lay of the land. A perfect excursion for family fun, afternoon dates or time spent with friends rides appeal to both the novice and expert equestrian. 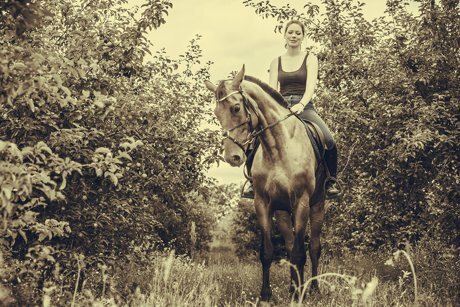 Trail rides are expertly led and start off with matching the horse to the rider. All riders begin their excursion in the arena where they get acquainted with their steed. Once pairs are comfortable with one another the adventure begins. Traversing over terrain horse and rider meander through creek beds, rolling hills and through shady trees. Groups are small in size adding to the intimacy of the experience. Youngsters who are timid towards the horses and unsure about going it alone need not worry. They can still take part with a trail hand leading the way on foot. Offsite rides add to the excitement. Sunnye’s Stables offers trips to various locations near and around Canyon Lake real estate. Destinations include but are not limited to Hancock Trails at Canyon Lake, Guadalupe River State Park and Pedernales State Park. Because of the added ruggedness of the terrain these rides are not recommended for riders with beginner skills. Children must be at least 8 years old to participate. More details about state parks and Canyon Lake rides can be found here. Youngsters with a love of horses and who want to expand their knowledge of the animals can take part in horse camps. Periodically on the calendar, these events explore riding skills, grooming, tack, animal care and more. Lengths vary from one day to one week. Horseback riding lessons take it one step further. Offered in both western and English style, private instruction lasts an hour and focuses on individual needs and desires. Come meet the horses and mount up at Sunnye’s Stables. A great time is waiting for play in the outdoors. First time riders and experts in the saddle will both enjoy the promise of the day. Reservations are recommended and can be made by calling 830.837.9959.